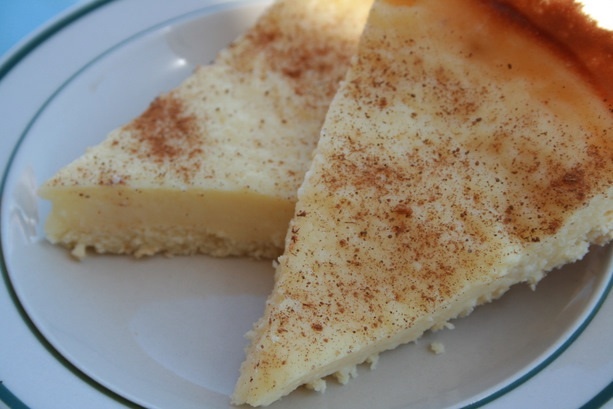 Milk Tart (melk tert), a South African dessert, is one of our favourite ways to use up both duck eggs and goat milk, both of which add extra richness to this cooked custard recipe.We modified this recipe for use with farm ingredients. Our muscovy duck eggs are big, with hearty bright orange yolks. Their consistency is more custardy than chicken eggs and it takes a bit of beating to break the yolk and fluff up the whites. You also need to give them a seriously good whack to crack the shells (the up-side of this is you can drop duck eggs and not have them break… ) Other than their size (one duck egg is equivalent to 1.5-2 chicken eggs), they cook up exactly the way chicken eggs do. There’s no odd ‘ducky’ flavour – they just taste like really good eggs. Try them in quiche, hard boiled, soft boiled, fried, scrambled, in baking… we have used duck eggs in all our favourite recipes that call for eggs.